An object is elastic if it returns to its origional shape after it is stretched and released. It is plastic if it does not, if it deformed. You need a force to stretch and object. The force the object feels is called tension. Hooke's Law, is based on an experiment in which the force used to stretch and object is increased and the extension measured. The graph on the right shows the stretching force, F, on the y axis and the extension on the x axis. 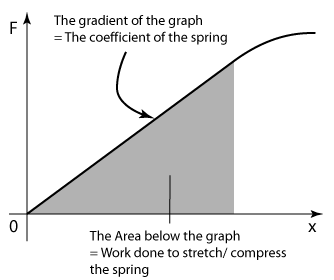 The spring constant, k, is a property of the material and essential defines how stretchy it is. If the spring constant is smaller, the object is easier to stretch. You'll notice that on the graph, there's a point that the force stops being proportional to the extension and begins to curve. This is the elastic limit. After this point the object won't return to its origional form, does not obey Hooke's law and becomes easier and easier to stretch.